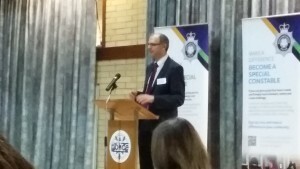 Northamptonshire Police and Crime Commissioner Adam Simmonds, on the 25th January 2016 hosted officials from 28 police forces across the England and Wales at Northants Police HQ for an event showcasing their Special Constables strategy. Speakers at the event included, PCC Adam Simmonds, Kathryn Buckle, Luke Harkin (marketing and recruitment), Kate Beck (assessments/on-boarding), Peter Ward (training), Special Constabulary Chief Officer Mike Maywood, Specials and Volunteers Sergeant Mark Holland, and Dr. Iain Britton from the Institute for Public Safety, Crime and Justice (evidence-based policing). Delegates at the event learned about Northants Police Special Constabulary’s ambitious growth from just over 250 Specials up to 636 at the time of writing, the challenges faced in this programme, and how these were navigated. With different forces at varying numbers of Specials, delegates were able to ask the panel of speakers questions regarding their areas of expertise with a view to developing their own strategy towards improving their Special Constabularies. Dr. Britton posted a blog about his talk on the subject of evidence-based policing on the IPSCJ website. Click here to read it.